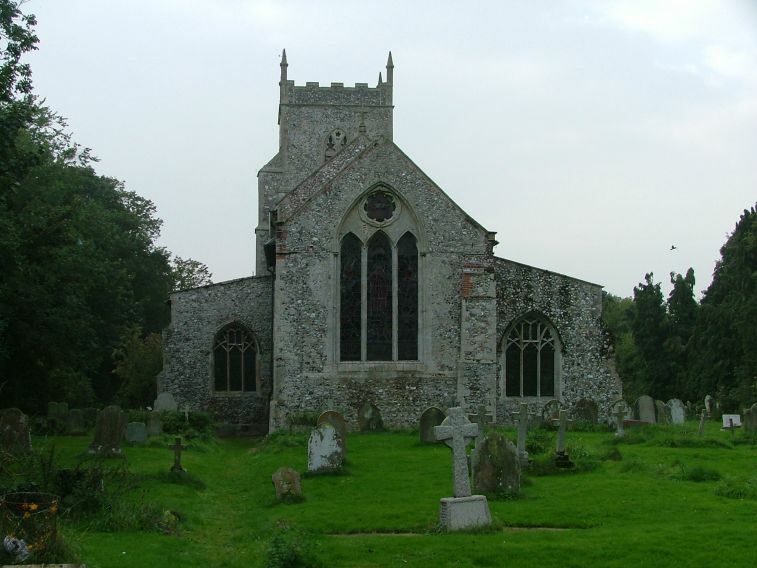 October 2006: We came down through west Norfolk on a stunning early autumn day. The sky was crisply blue, the air warmed but full of the smells of the cold earth exhaling. I love this time of year. I love the way that the afternoon light thins out; all is safely gathered in, Norfolk closes in on itself, and the secretive countryside prepares itself for another winter. All day, all the churches had been open. It was a time of harvest festivals, usually on quite a small scale, with a scattering of pumpkins on window ledges, carrots and turnips piled around fonts. 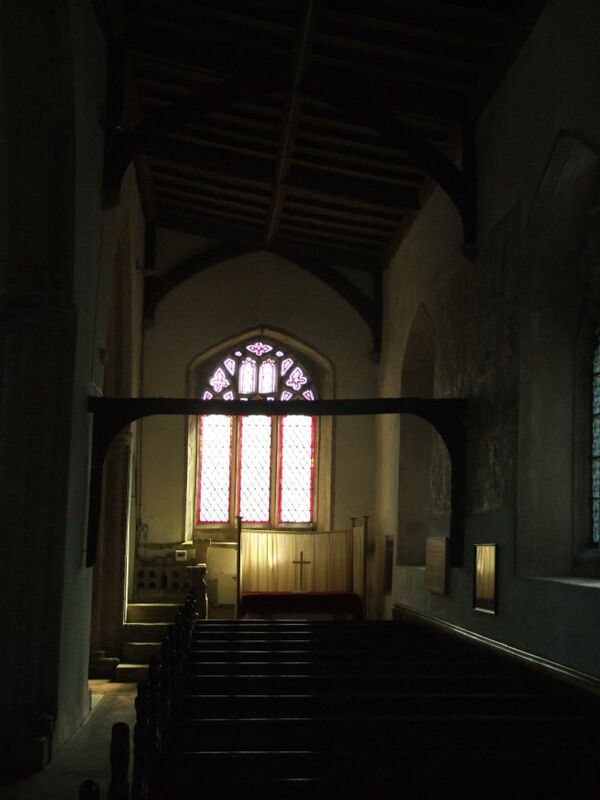 The cool, damp taste of the air in an English village church was tempered by the sweet aromas of apples and plums. We were weaving southwards, left and right of the Swaffham road. We came through busy, purposeful villages that were off the beaten track: Great Massingham, Rougham, Wellingham. We headed onwards and found Sporle, another large village, its long pretty street flanked by a stream, a pleasing bridge carrying across to the church on the hill. 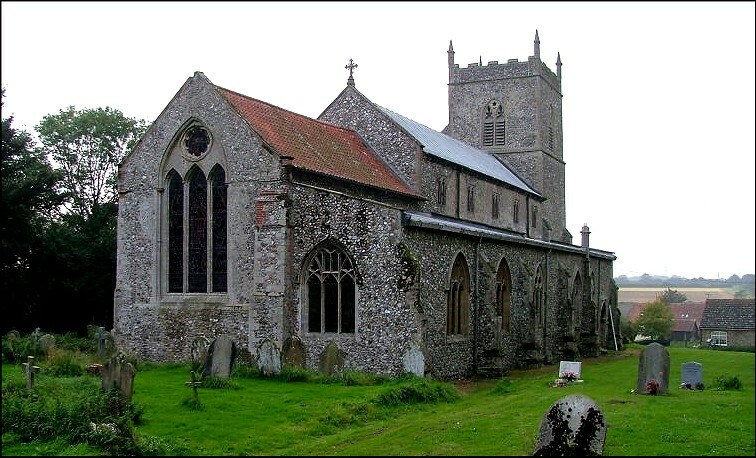 On the face of it, St Mary is architecturally fascinating, a perfect example of Early English drifting into Decorated. However, there was a massive restoration here in the 1890s by the clumsy Diocesan architect Herbert Green, so what you see needs to be looked at carefully. Much of the north side is his, I think, and can that plate tracery be original? Perhaps the answers are inside. I want to tell you a story about Sporle church. Peter Stephens, a regular churchcrawling companion of mine, had visited here a year or so previously. It had been a Sunday morning. 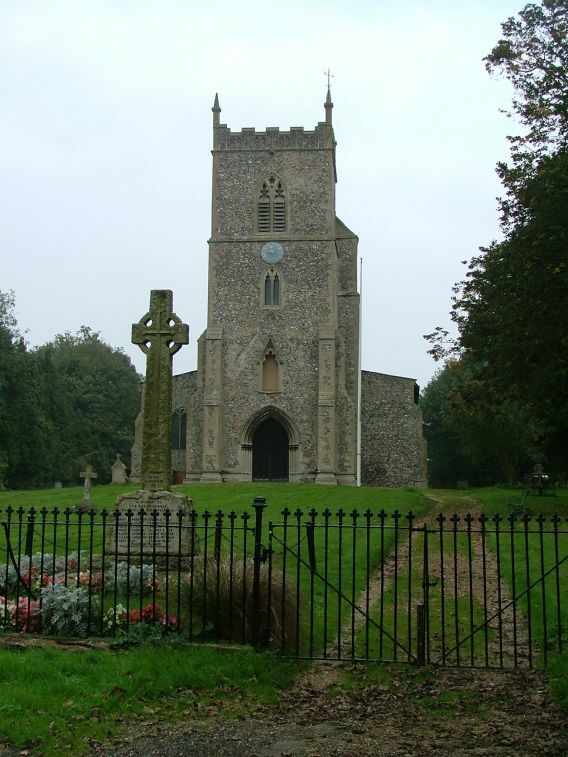 This is usually a good time to visit churches in Norfolk; very few of them manage a service each and every Sunday. Peter parked on the village street, and crossed the bridge. There didn't seem to be anyone about, and so he climbed the hill to the church. Walking past the tower, he found the south door, which lets directly into the church. There isn't a porch, and the door has a traditional handle as well as a yale lock. Peter tells me that he turned the handle, and pushed. But the door was locked, and it wouldn't open. He rattled the handle a couple of times, but no; it was definitely locked. He stood for a moment, looking around for a keyholder notice. There wasn't one. And then, suddenly, the door opened. It opened just a fraction, just enough for a tall man to put his head out. He took one look at Peter, and said "You can't come in. There's a service on." And then he shut the door again. This seemed to me an extraordinary thing to have happened. There was a hint of the absurd about it. 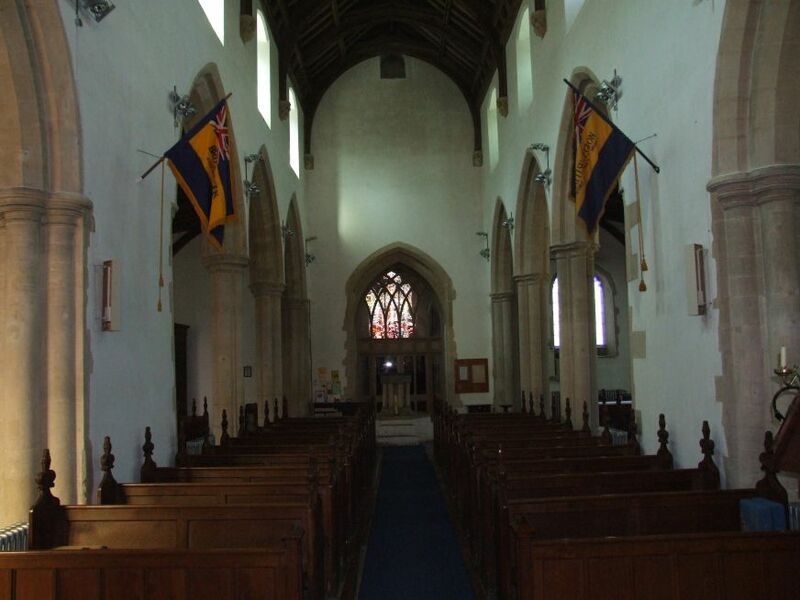 The vast majority of village churches are very welcoming, and would certainly be pleased if a stranger turned up while a service was on. I wondered if it had been someone having a joke, but Peter said no, he could hear the sound of voices within. I thought about this story now as we headed up the path to the church. 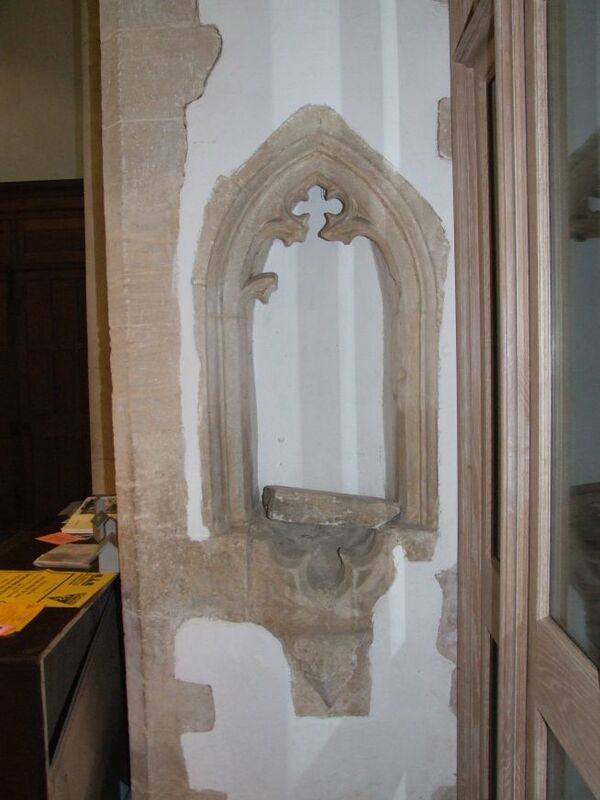 The great empty niche above the west door, which looks partly late 13th century and partly Herbert Green's, looked down on us blankly. 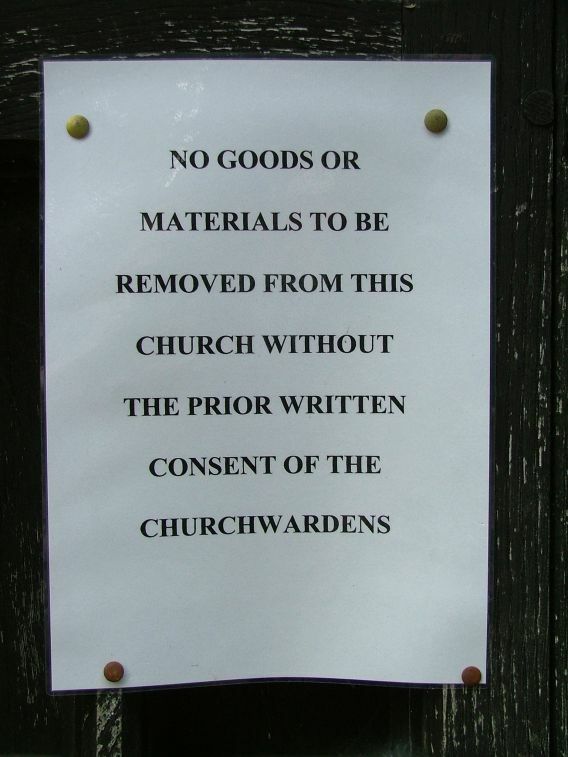 We headed around to the south door, and found a laminated notice pinned to the door: NO GOODS OR MATERIALS TO BE REMOVED FROM THIS CHURCH WITHOUT THE PRIOR WRITTEN CONSENT OF THE CHURCHWARDENS, it said. Well, what a strange thing to find. It is self-evident that no church wants its furnishings stolen, but why on earth was this notice necessary? Did they think it would be more effective than a burglar alarm? The door itself, unsurprisingly, was locked, and there was still no keyholder notice. I rattled the handle noisily for a while, but nobody opened up. This was frustrating, not least because St Mary has a good cycle of the martyrdom of St Catherine, and I had been looking forward to seeing it. A small priest door to the east was covered in cobwebs, and clearly had not been opened for years. We wandered around the church, which is very imposing whichever side you see it from. The graveyard is gorgeous, and seen from the east the setting is dramatic. But even the plate tracery of the east window seemed to throw a blank stare at us. 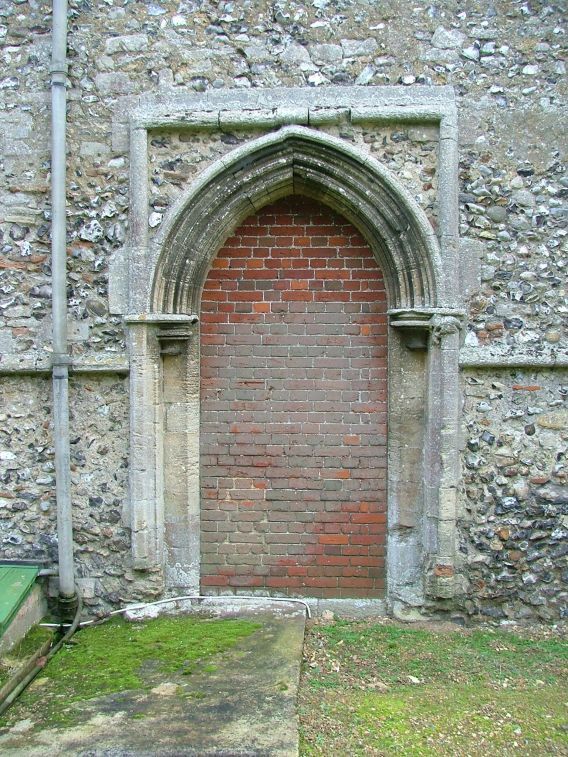 The north door is actually bricked up, which was appropriate under the circumstances. The west doors were also locked, and for want of any other ideas of how to effect an entry into Fortress Sporle, we scratched our heads and then went back to the car. 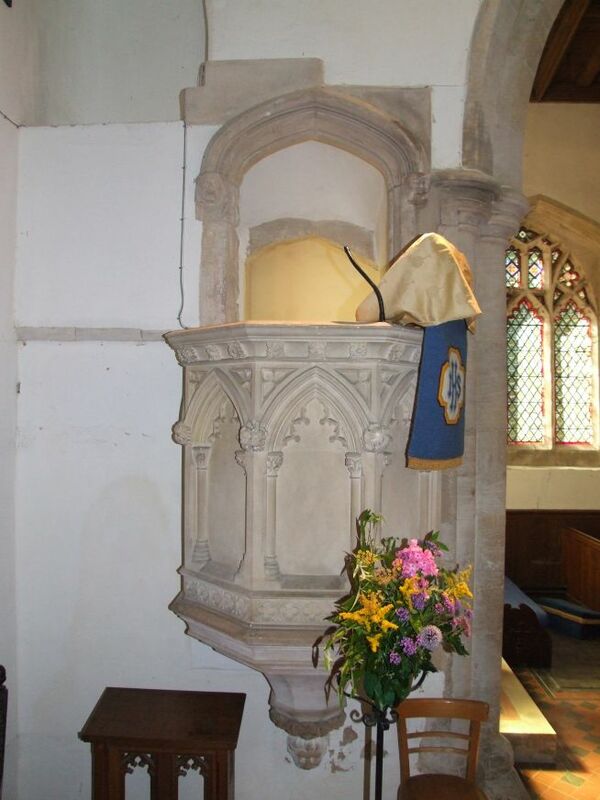 So, what on earth was going on at Sporle church? Thinking about it afterwards, I came up with a number of possibilities. If the church was now redundant, the 'service' that Peter had encountered might actually have been something unofficial, and perhaps even something that shouldn't have been going on at all. If that was the case, then no wonder that they wouldn't let him in. But no; Sporle was surely much too big a village for its church to be made redundant, and it was the work of a few moments to discover that it was still a working building. And so I wondered if perhaps there had been some kind of feud going on between rival groups within the congregation. Perhaps there were two factions, holding separate services and rearranging the furniture accordingly. Perhaps the dispute over removing 'goods and materials' was something to do with people claiming ownership of liturgical furnishings.This would explain the siege mentality when Peter tried to enter during a service, and would also give a reason for the very strangely worded notice. But was such a turn of events really credible outside the covers of a JL Carr novel? August 2007: We came back to Sporle about nine months later, on one of the hottest days of 2007, only to find that the annual Sporle fete was in progress on the school field. We walked around to the church, and found that on the outside of the south doorway there was now a keyholder notice, listing no fewer than four keyholders. It still isn't clear to me if this was a result of what I had written the previous year. Not unreasonably, they were all out, shying cocunuts and beating the keeper no doubt. But it was a step in the right direction, and so a few weeks later, on another beautiful summer day, we returned again. Remembering the notice, I went to one of the keyholders, who turned out to be a delightful old lady with a cockney accent. She reiminded me of my wife's great aunts, who all came from Bethnal Green and Whitechapel. "Have you got any identification?" she demanded. As far as possible, I deliberately carry no identification, but I did offer her my bank card. She laughed, and declined it. "There you go", she said, handing me the key. "Enjoy it". And so, Peter and I stepped inside Sporle church for the first time. My first impression was of how dark the inside was, even with the south door open, thanks to the box around the doorway, reminiscent of churches in France. The windows, which we had previously been unable to look through, turned out to be full of high quality printed quarries from the late 19th century, very expensive at the time, I should think. 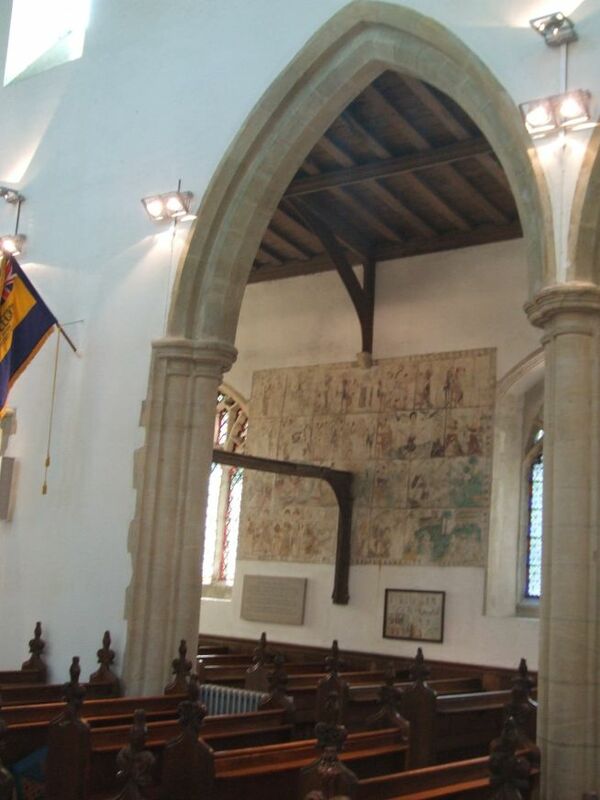 The famous wall painting of the life of St Catherine is on the wall of the south aisle, and as our eyes became accustomed to the gloom, the images resolved themselves. 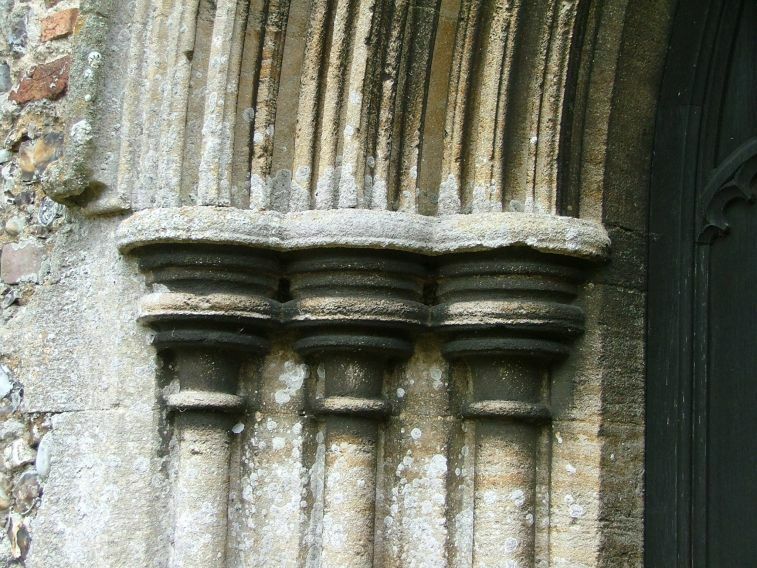 There are about 24 of them, and Pevsner points out the self-evident truth: there are two distinct series, the first of which, consisting of the initial eleven frames, he dated to about 1400, and the rest to a few decades later. The candle beam of a parclose screen still runs between the south aisle and the middle of the painting, suggesting that it post-dates it. 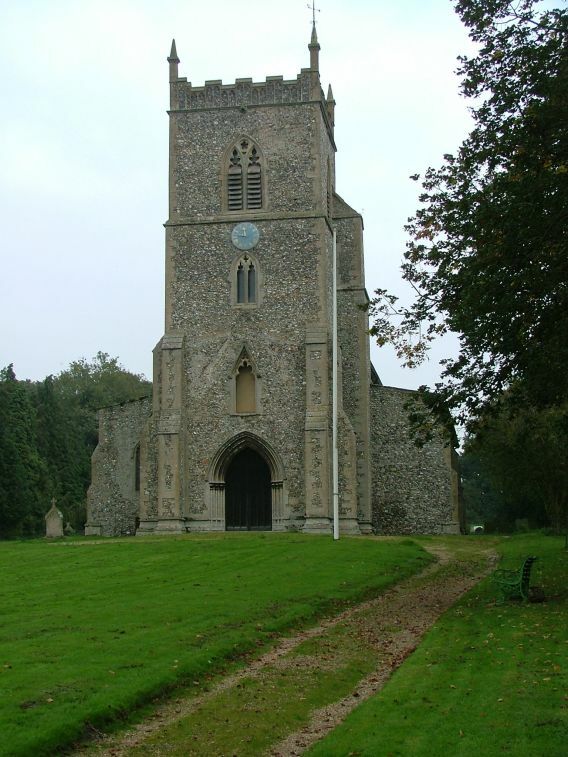 Pevsner is very good on the architectural history of the building here, which is one of the most complex I have come across in a Norfolk church. As we wandered around, it was like encountering a series of rooms, finding piscina after piscina of different ages, arcades which alter and contrast, places which appear to have once been exposed to the elements, and so on. With the caveat that it is not entirely clear what Herbert Green did, it looks as if the entire building, pretty much, was in place before the Black Death. 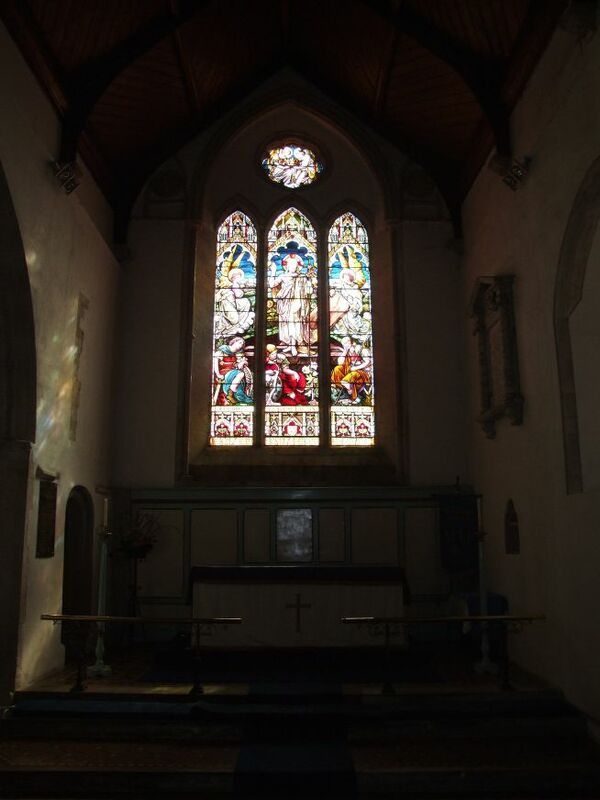 After that, there was window tracery and the famous wall painting to come, but that's about all. 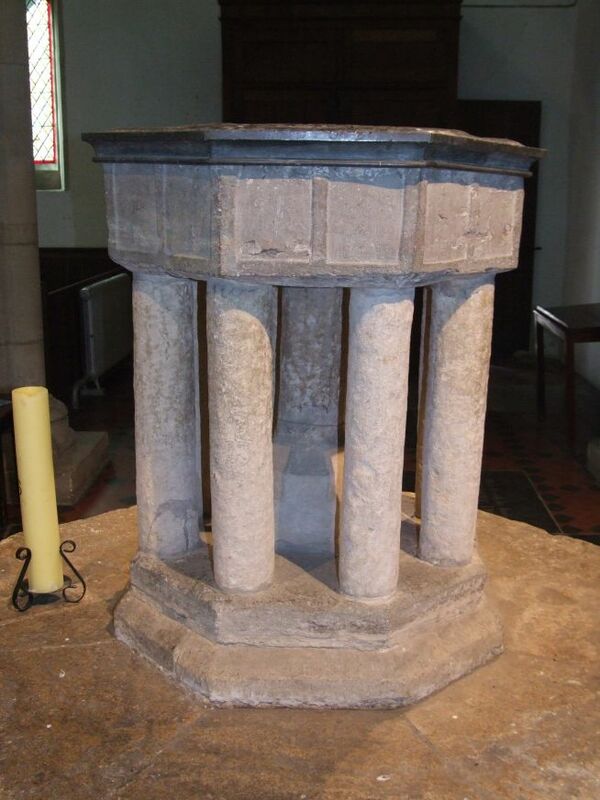 The font is a typical purbeck marble octagonal job, reset on a 19th century collonade. On its great dias, it is imposing and attractive. 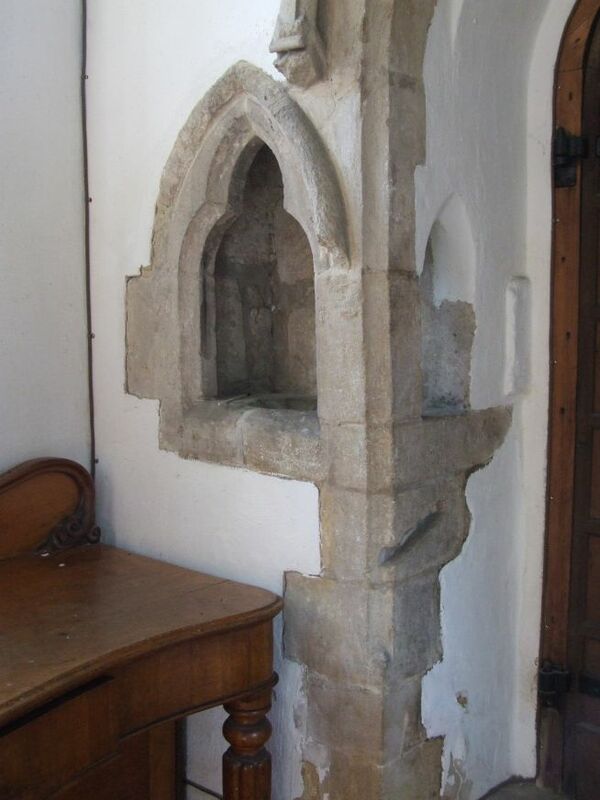 In contrast, the stone pulpit is mildly absurd, reached by a stairway that cuts through the former rood loft stair doorway. it as well that most other churches don't have one like this, but I was glad it existed here. As for the church itself, I thought it was extremely interesting. I couldn't see any reason for it ever having been kept locked, and I was pleased that the parish had seen sense. Sporle is deserving of visitors and support - it is well worth a visit.